My children recently took a French language class in their home school co-op and loved it. Since I was raised in a family that spoke both English and French, I believe it is important to encourage my three children to learn a second language too. After co-op was complete, they were expressing an interest in learning about other languages. In order to support their goal, I introduced them to the “Learn a Language” DVD by Rock ‘N Learn. The Rock ‘N Learn “Learn a Language” DVD (SRP $19.99) is a surprisingly comprehensive introduction to languages from around the world and features six languages including English, Spanish, French, Italian, German and Chinese (Mandarin). This DVD has a whopping 3 hours and 42 minutes of total instruction time with each language broken down into a manageable 37 minutes in order to hold the child’s attention. The program is flexible so that I can choose to use the subtitles or turn it off. I like that I can also choose the language to practice directly from the main menu and set up is very user friendly. This DVD is recommended for ages 2-6 and my children were very excited to get started on learning a new language. They chose German for the first viewing of this DVD. This Rock ‘N Learn title features many of our favorite characters, uses vibrant animation and real images to relate the new vocabulary word to the object featured. What I liked right away about this DVD, is that the subject matter and language is interesting and appealing to a younger audience as children learn how to say the words of common items found around the house (along with colors, counting to 10, clothes, toys, etc.) in English and German. It also uses repetition (without becoming dull) in order to help children remember the word along with a recall section so that the children can practice their newly acquired sounds. The program is precise with clear instructions for the child to follow along with so that there was absolutely no frustration for any of my kids while learning new vocabulary words in another language. Each day my children chose a new language to practice and then when they had explored the six languages we could choose which ones they wanted to revisit again for further practice. 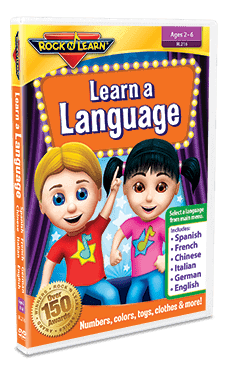 Overall, the Rock ‘N Learn “Learn a Language” DVD was a hit with my children and they loved discovering new languages. Since we homeschool, I was able to incorporate this into several areas of our classwork including English, social studies and geography. If you are looking for a great introduction for younger children to a new language then I highly recommend purchasing this title from Rock ‘N Learn! You are invited to visit Rock ‘N Learn to select this DVD and to browse the entire selection of high quality educational DVDs, CDs, Apps and more. There is a wide range of subjects for various grades, interests and ages available from Rock ‘N Learn! I would get the Spanish one. My favorite Rock ‘N Learn DVD would be Dance With The Animals. Carter loves dancing so I would most likely choose the Dance with the Animals – but perhaps the Alphabet Circus would be cool too!